The Rigid Industries’ Radiance™ Multi-Trigger Harness was designed specifically for the Rigid Industries’Radiance light bar. 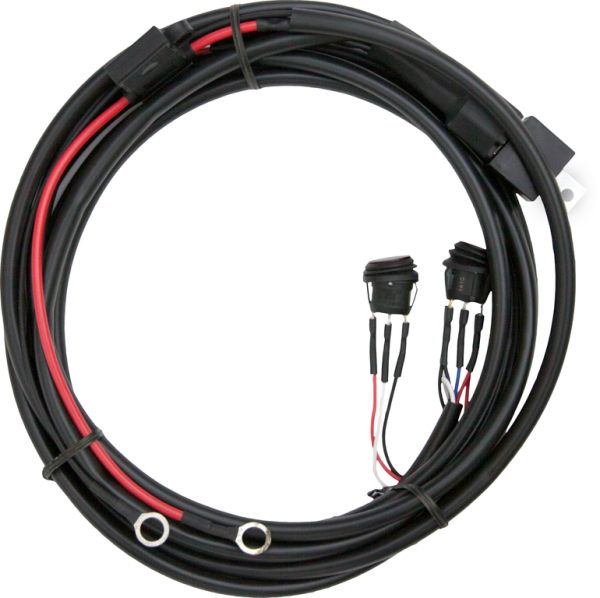 Equipped with two independent circuits for an easy install, circuit one is designed for higher amperage and utilizes a relay to power the primary LED’s on the Radiance light bar; while circuit two is designed for low amperage and has no relay for the backlighting circuit on the Radiance. The Radiance Multi-Trigger Harness also comes standard with two separate backlit LED rocker switches (red and blue), so each circuit can be used independently. The Radiance Multi-Trigger Harness makes installation of your Rigid Industries’ Radiance as simple and clean as possible. Circuit 2 is designed for low amperage/no relay for backlighting circuit. Two backlit LED rocker switches included for independent on/off of primary LED’s and backlighting. Three connectors with built in heat shrink ends to be used for splicing in the pigtail.